It’s not fair. I mean, what game has a chance against Nocturnal Media’s King Arthur Pendragon RPG? Am I giving away the ending? Oops. Please carry on. I’m going to approach this review as if you know nothing about previous versions. That said, King Arthur Pendragon 5.2 is a mainly cosmetic update from KAP 5.1. I own both in PDF and 5.1 print-on-demand hardbound, and they contain mostly the same content. A few errata have been merged in, but otherwise, the two versions can be used interchangeably. Primarily, the changes relate to layout and art. But, oh wow. The new art is impressive. The Pendragon book isn’t the most massive RPG book I own, but it’s nowhere near the smallest either. Most of my previous reviews have been of minimalist RPGs who’s rules could be distilled into a few pages if you wanted them to be incredibly dense. KAP runs 272 pages if you include the newly redesigned character sheets in the back. The layout is improved from 5.1 as well. I can’t speak for the book quality since I’m still waiting on a hardbound copy from one of Nocturnal Media’s Kickstarters I backed last year. I’ll update this post when I have my copy. At any rate, for $19.99 you can get the PDF on DriveThruRPG. It’s a decent price for a book this size. Once Nocturnal’s offset print run is available, you’ll be able to pick up hardcover copies as well. The art in Pendragon 5.2 is masterful. It was pulled from the Spanish version of the game, where they also have additional updated products. I was lucky enough to flip through the pages of the Spanish versions of King Arthur Pendragon and The Great Pendragon Campaign on a recent trip to Spain, plus a fantastic GM screen that I bought tucked in my carry-on for the trip back to the US (pictured below), and they are all glorious. Full-color art and plenty of it, and that cover. Drool. I can’t wait to have it on my shelf. P.S. That store in Barcelona had fiction and non-fiction books, RPGs, board games, Magic, and plenty of fun toys. They had a clean and pleasant atmosphere, friendly staff, and space to play (3 RPG sessions going on while I was in the store). The kicker? They had the absolute largest RPG section of any store I’ve ever visited in any country. Someone want to build one of those right down the street from my house? I promise to be a faithful patron– please? Nothing new here if you are already familiar with perhaps the most excellent RPG ever created. I’ll summarize for those who may be unfamiliar. KAP is, surprise, about ancient England and being a knight (male or female) and chivalry and romanticism and magic and a brilliant system for role-playing. So aside from the fact you get to play a knight with the opportunity to make history, build a family and a legacy (all part of the rules), and potentially even join Arthur at the Round Table, there is also a deep and strange connection to Merlin and the magic of faeries. However, for me, the system is the other standout element. It’s no wonder there are multiple games in production built from the KAP ruleset, including Paladin: The Warriors of Charlemagne and a forthcoming game set in feudal Japan. One of the things I love the most about the system is the Traits. I’ve never seen a game take a similar approach. Each trait is a matched pair like Prudent/Reckless or Valorous/Cowardly. The total score of the pairs must always add up to 20 (e.g., if my knight has a 6 in Merciful, she has to have a 14 in Cruel). When a player decides to have their character act against their traits, the GM may ask them to roll. For example, if I want my knight Phillipa to spare the life of a peasant who caused her to be unhorsed and publically humiliated, I would have to roll under her Merciful score on a d20. If I fail, I will roll to see if I score under my Cruel score, if I do, I must behave cruelly. If I do not, I can choose for myself. There are several reasons I like this approach as a player and a GM. First, it’s effortless to get into character when you know you’ll be rolling and facing the consequences of failure to follow your character’s natural path anyway. There are also passions, skills, and attributes. All of them contribute to the effectiveness and demeanor of your character. Any of these stats may be raised over time, and as you gain glory (Pendragon’s experience… sort-of), you’ll have more opportunities to do so. Considerable effort has gone into providing everything needed for a GM to run a game of chivalry, virtue, and bravery. The flavor of the game should be entirely apparent for players if you are following the guidance given here. Ever want to fight a bear and become a knight and make “the leap”? I ran this adventure as a one-off RPG session for the first time a week ago for a group who’s go-to game is D&D. They loved it, with the exception that a couple folks rolled a few too many 20s. 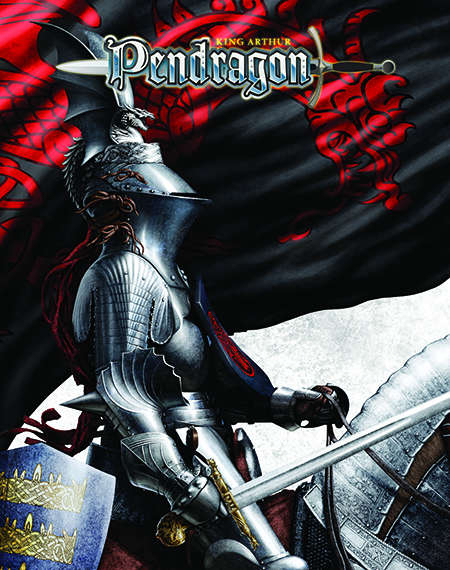 I’ve played this adventure as well, and I’d say its very well balanced and encourages the use of many of the Pendragon’s mechanics naturally and organically. It’s a good three hours at least if you run with the pregenerated knights from the back of the book. I own almost the entire Pendragon library. Some books, more than one copy. It’s very high on my list of RPGs. The score feels good to me. This is the first non-TinyD6 game I’ve reviewed. It held up well! Look for future Pendragon book reviews, and perhaps something Trek and/or Hobbit-inspired soon as well. Here’s the deal folks. I’m not an RPG reviewer. I can’t pretend I’ve read all the books currently on the market, or even all the books I actually own. I love Tiny D6 games (Tiny Dungeon, Tiny Frontiers) as some of the best minimalist RPGs I’ve personally played, so I’m going to write an RPG review… even if it isn’t completely unbiased. Fair warning: I play RPGs with the author of Tiny Frontiers: Mecha & Monsters on a fairly regular basis. I’ll do my best to remain unbiased, but keep this in mind. Today I’m reviewing the Kickstarter edition of Tiny Frontiers: Mecha & Monsters by Alan Bahr . It’s a minimalist STAND ALONE (that’s right, you don’t need the original Tiny Frontiers to play) sci-fi RPG about giant robots and hyper-destructive kaiju, designed to play on the run, with new players, with kids, or just with your normal group when you are between campaigns. The Tiny Frontiers book isn’t huge. It clocks in at 164 pages in with gorgeous full-color illustrations and layout. There are sidebar callout, sensible tables, and has an overall clean look. It’s well organized and easy to read. The paper quality and binding are great. In short, the producers learned lessons from their previous projects. This book it top notch quality. At any rate, the standard book is priced at $15 and the PDF on DriveThruRPG is only $10 at the moment. For my money, a huge bargain. It’s also available in hardcover print on demand for $30. The art in Mecha & Monsters is far above average for an RPG. I’ve seen Ennie winners with worse art. There’s plenty of it, and it’s very evocative of the setting. I guess there could have been a little more? This is picking some serious nits. For me, there are two areas where Tiny games really excel. This is one of them. The original TD rules are a great minimalist take with only 3d6 required to play. The Tiny D6 ruleset has been adapted for Mecha and Monsters with great effect. The game is still minimal and simple, getting out of your way so you can tell great stories together. Win. In Mecha & Monsters, the GM section is a bit expanded over previous Tiny games. It has some nice guidelines for devastation, plenty of tables for random generation, and some guidelines for how to keep games about this particular brand of game fun. I’ve said it before, and I’ll say it again: I LOVE MICRO SETTINGS. Part of the stretch goals for the Kickstarter were micro settings written by sci-fi authors, RPG luminaries, and generally talented folk. People like Steve Diamond, Robert Denton, Marie Brennan, and Elizabeth Chaipradikul to name a few. I can’t say enough about how easy and fun it is to read a 3-5 page micro setting, take one of its adventure hooks, and run with a fun session. All this in mere minutes. The highest score I’ve ever given. Not that I’ve given many. I’d purchase this game again. POSTSCRIPT: Alan Bahr runs a tight KS ship, and he is running an amazing Kickstarter right now for Nocturnal Media. It isn’t sci-fi or minimalist but is it one of my all-time-favorite rulesets (King Arthur Pendragon– it’s possible KAP 5.2 will be my next RPG review), and the game is absolutely gorgeous. Also, a huge chunk of the proceeds goes to the widow and family of Stewart Wieck. Paladin was a labor of love for Stewart. Check out the Kickstarter. I don’t think you’ll be disappointed. William L. Munn is a writer, gamer, professional nerd, and general lover of fantastical stories. Will has written for gaming companies like Gallant Knight Games, where he has assisted with works such as Tiny Frontiers: Revised, Cold Shadows, and Mechas and Monsters.